A terrific fee-simple home (no strata fees) with an excellent floorplan. This excellent 3-level unit provides terrific separation of space. The lower level has a large bachelor suite with private patio. The main floor boasts a lovely open plan with kitchen, dining and living room designed for casual living with front and back sundecks to maximize your sunshine and light. Elegant living room fireplace, stylish laminate flooring and fabulous kitchen with maple cabinets with generous island. Upstairs has a generous master bedroom with full ensuite,walk-in closet, 2 additional bedrooms & laundry. 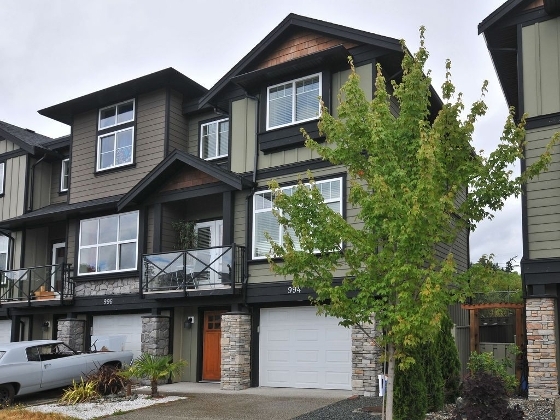 Close to schools, downtown Langford, parks and much more. Don't miss out. Call Today!